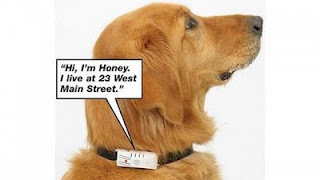 A pet collar that talks and kicks out the fleas!!! It’s common knowledge that owning a pet can have many health benefits. A pet can reduce stress and anxiety, help to combat loneliness and even encourage you to exercise. So it’s no wonder that we want to keep them safe from harm. This pet collar from Riddex apparently protects your furry friend in two ways – if your pet goes missing, it literally “tells” people how to contact you and it also uses safe ultrasonic pulses to repel fleas. The collar could eliminate the need for nasty flea sprays and chemicals as the safe ultrasonic pulses are apparently sufficient to deter fleas. The recordable pet tag allows you to record a message to identify your pet and leave relevant contact information. You may even want to leave reward details. Then, if your pet goes missing, it may be more likely that he is returned safely to you. This collar is possibly a novelty item, but if it does as it promises, it could save you a buck or two in flea treatments. The collar comes with batteries and retails for USD $24.99 from Picket Fence.